Repair the roof when there is sunshine similarly shape your child when they are kids.I want to thank you for choosing this book, ‘I Can Do Homework Myself - Children Self Esteem And Social Skill’ and hope you find the book informative and interesting.It is important for a child to develop social skills and healthy self-esteem at a tender age. This will help him be more confident about who he is and what he can achieve. If a child wants to develop friendships and sustain those friendships, he must be confident about himself. It is important for a child to know how to speak to people.If you are looking for different ways to motivate your child to be a more confident and a happier version of themselves, then you have come to the right place. Over the course of the book, you will gather information on what self-esteem and social skills are. You will also learn why these are important, especially for children. 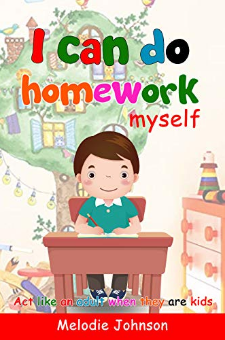 The book also contains some activities that you can use to help your child develop a healthy self-esteem and better social skills.You will also find some tips in the book that will help you motivate your child to do his homework quickly. Remember that you are working with a child. When you make an activity enjoyable, they will love doing it. Use their enthusiasm and teach them how to be more confident about themselves.Thank you once again for purchasing this book. I hope the activities in the book will help your child shine and build self-esteem, which in turn improve his social skills.Every human being must develop a healthy self-esteem and positive self-worth to succeed in life. This applies to children too. This book provides you with some exercises and activities that will help you motivate your kid to be more successful.I hope the activities in the book help your child excel in school and in life. Good luck!! !Thanks again for downloading this book, I hope you enjoy it!